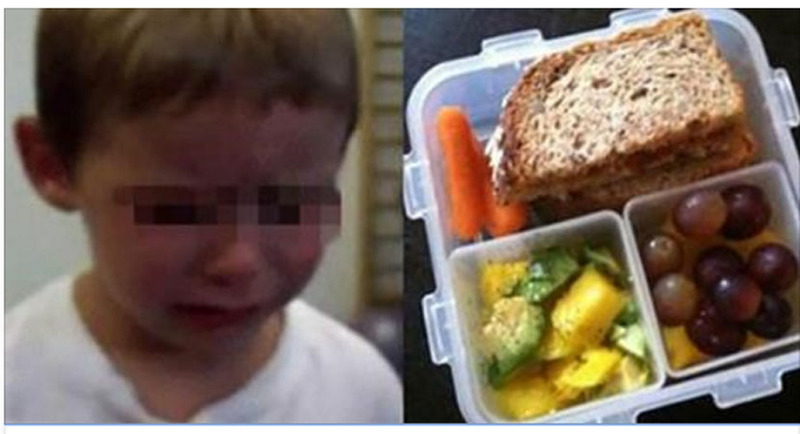 It happened in the school district of Durham, Ontario, where kids were told they could’t eat parts of their packed lunches because they were called “unhealthy” by school officials. It’s a new healthy eating initiative and parents are extremely upset. A mom named Elaina Daoust said she was “infuriated” when her son was told that he was not allowed to eat his morning snack. It was a small piece of banana bread, but since it contained chocolate chips, it was considered unhealthy by the school. The grapes from his lunch would have to be eaten instead. Her son is apparently very picky and teachers discouraged home-baked items due to allergy concerns, so this was pre-packaged and labeled “nut free”. The new school the child now goes to has not given her or her son any problems. The officials with Durham Catholic District School Board state that a difference exists between teaching kids to eat healthy and actually critiquing what they bring to school. Teachers shouldn’t single students out, he also added. “It’s up to the students to share that information with their parents, we’re educating and promoting but not dealing with it at snack time,” he said. But there have been over 30 parents in the district who have shared similar stories regarding being singled out and having food not allowed. Here are some of the common food grabs that school officials have not allowed the kids to eat: Goldfish, granola bars, string cheese, Jello, juice boxes, pudding, fruit snacks, raisins, Animal Crackers, chocolate milk, and Sun Chips. Another mom talks about how her second grade daughter got her lunch sent home several times last year, due to it containing pizza on a non-pizza day. She adds that one time her daughter was given an orange to replace her packed lunch. Sometimes her daughter ended up simply not eating because teachers sent her “unacceptable” food back home. Share this story with all your friends and family!